Every year, computers get smarter. They solve complex math problems, analyze research, steer airplanes, build cars … even turn off your stove remotely. Soon, they may drive you to work! They can also, of course, give you instant virtual answers for just about any question you might have. And since about 77 percent of Americans now own a smartphone, you probably use a virtual assistant yourself. If you are one of the many Americans who uses Siri, Cortana, Google Now, Google Home, or Alexa, you might be interested to learn how your virtual assistant stacks up against the competition. We did some research and surveyed 100 owners of each device to find out how they compare. Continue reading to learn more. Who’s Best With Verbal Commands? When we asked survey respondents how they felt about their mobile assistants, their response was pretty positive overall. Siri had a 65 percent satisfaction rate, while 59 percent of participants were satisfied with the voice recognition of Google Now, followed by Cortana’s 46 percent satisfaction rate. 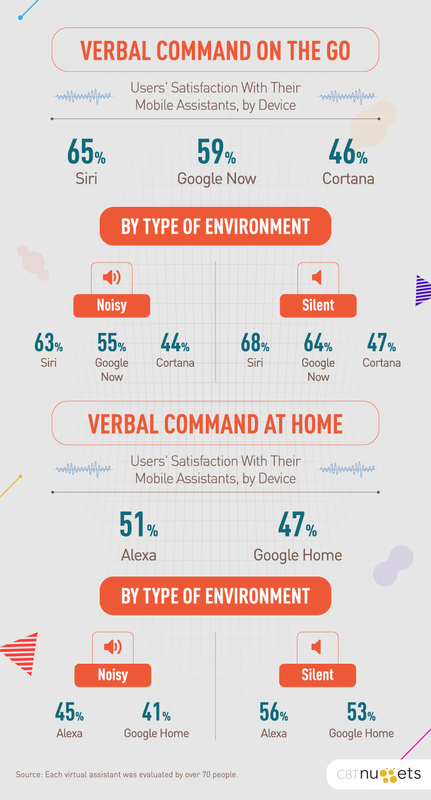 When we broke the data down by environment, Siri received the highest marks across the board, with nearly 63 percent of respondents satisfied with their virtual assistant’s performance in a noisy environment versus almost 68 percent in a silent environment. 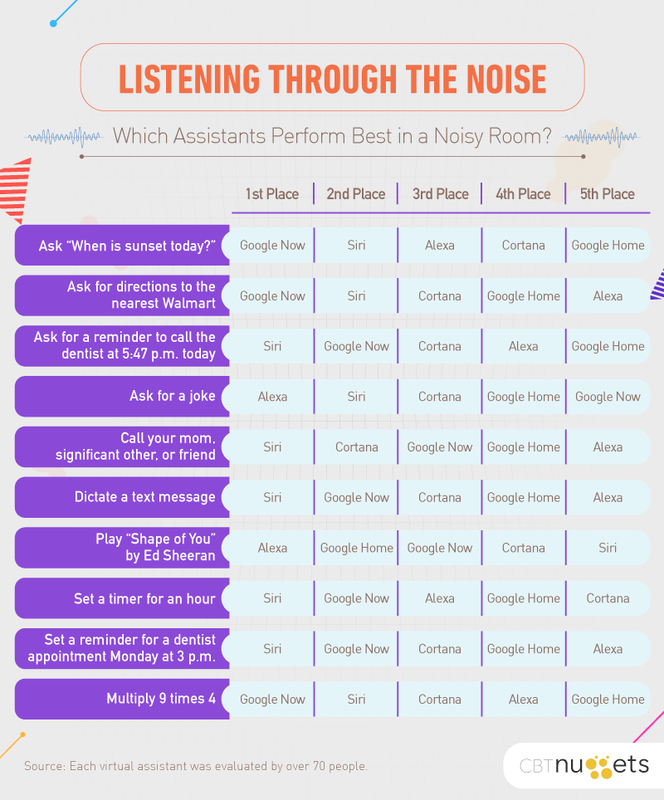 It was Google Now, though, that had a bigger discrepancy in performance, with about 55 percent of users satisfied with this assistant in a noisy environment and more than 64 percent in a silent environment. Cortana had less than a 50 percent satisfaction rate in both cases. Next, we compared Google Home and Alexa. Overall, Alexa won the day with a 51 percent satisfaction rate, compared to just under 47 percent for Google Home. In a noisy environment, Alexa’s edge over Google Home was less than 5 percent, and just over 3 percent in a quiet space. Tech reviewers tend to agree, as they generally rank Amazon’s product higher than Google’s when it comes to home assistants. 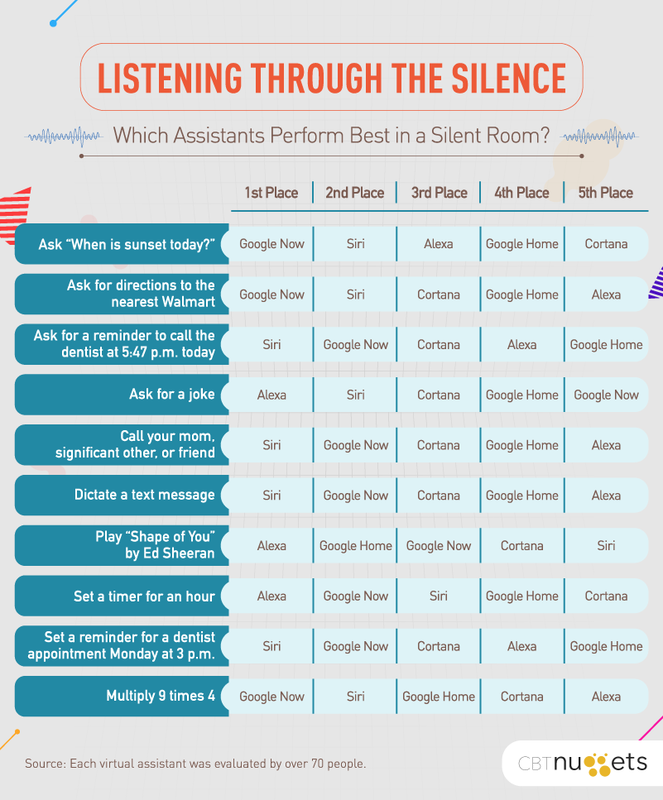 In quiet spaces, Google Now, Alexa, and Siri accounted for all of the first place showings when asked to perform particular tasks. Alexa proved itself to be the best at playing a song on command, while Google Now placed ahead of the pack in providing directions to a store nearby. In a room full of laughing houseguests or in a busy airport lounge, however, we found different results. Siri brought home the most first place scores in a noisy environment and tied with Google Now for the most second place finishes across all categories. In both quiet and noisy rooms, though, Siri came in last place for playing a specific song. Alexa performed this task the best out of all of the virtual assistants. When it comes to background noise, Siri performed best, completing a task when asked the first time in 65 percent of scenarios. Google Home only understood questions and commands the first time in 45 percent of scenarios. Phone cases, as it turns out, also make a difference when it comes to virtual assistants understanding us. In a silent environment, Siri got requests right about 71 percent of the time when participants’ smartphones were not in a case, and 68 percent of the time when their phones were in a case. Similarly, Google Now got requests right 66 percent of the time without a case and 58 percent with a case. 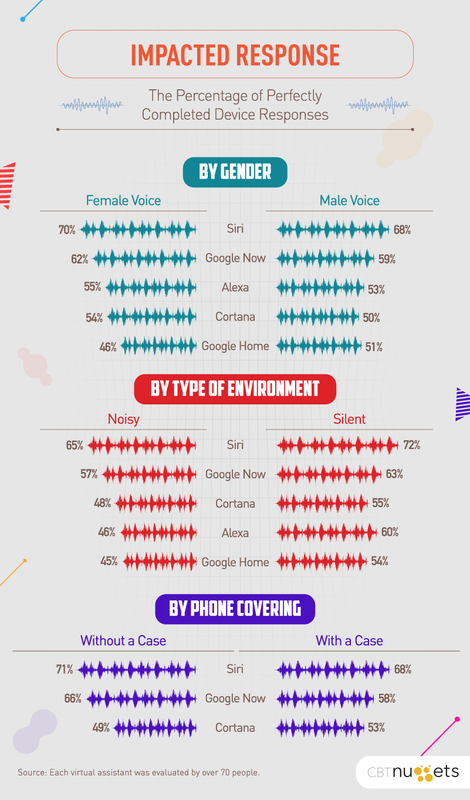 Additionally, Alexa, Cortana, Google Now, and Siri followed directions better when they came from a female voice. Google Home got it right the first time more often with men. Most of us use our virtual assistants to set reminders, get directions, find nearby shops, or make a call, but what else do these smart tech gadgets offer – and which features do people love most? For Alexa, Siri, and Cortana, the answer (by a long shot) was jokes (of which Siri’s were the most popular). We love to ask silly questions and get surprising answers. Meanwhile, back at home, the most loved extra on Google Home was its music, followed by jokes and Beatbox. Google Now ranked high for its dice roll option, as well. Which Virtual Assistant Works Best for You? When it comes to the best virtual assistant, there are a lot of opinions out there, but at the end of the day, what matters most is whatever matters to you. Do you need a virtual assistant but work in a noisy office? Do you need more assistance with appointment-setting versus entertainment? There are a lot of factors to consider when choosing the right virtual assistant, so it’s important to consider how to optimize these technologies to make your job easier! At CBT Nuggets, we offer more than 200 online IT courses to help your team learn more about the cloud, security, virtualization, as well as get on-the-job guidance. Our vendors include big names in the business like Microsoft, Cisco, and Google, and our training videos are short and sweet, making it a convenient option for your busy schedule. Encourage your team to learn new technologies! Learn more about our training, labs, and accountability coaching online today at CBTNuggets.com. We surveyed 500 people – over 70 people who own and use each device featured in our study. The devices were Siri, Cortana, Google Now, Google Home, and Alexa. Survey respondents were asked to perform commands using their device in both silent and noisy environments and report their satisfaction with the way each command was performed. You can share this content with your own audience freely for non-commercial use, just ask your virtual assistant. Be sure, though, to give us credit for the research by linking back to this page.